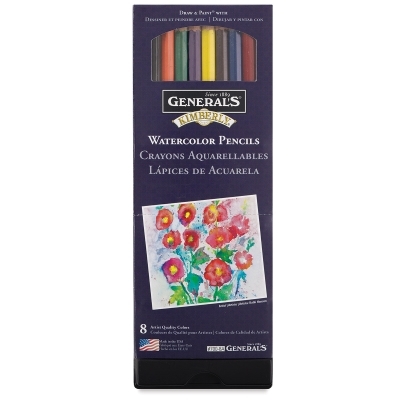 Draw and paint with vibrant colors that respond like watercolor when wet. Blend color with a brush, draw directly into washes, or dip pencils into water for intense color. Sets to 24. Set contains eight pencils, including Blue, Brown, Red, Purple, Dark Green, Orange, Lemon Yellow, and Black. ® General's is a registered trademark of the General Pencil Company.® Kimberly is a registered trademark. ® All-Art is a registered trademark.® Masters is a registered trademark.